In 1987, director Paul Verhoeven unveiled RoboCop, a satirical science fiction blockbuster that has been long celebrated by critics and audiences as a classic of the genre. Despite offering gruesome thrills and unrelenting action, this beloved classic has even earned recognition from the prestigious Criterion Collection and was released by the arthouse company on laserdisc and DVD a few years back. It should come as no surprise that a remake of RoboCop was rumored for many years—unsurprisingly, really, considering that Hollywood is running on fumes in the creativity department. After almost ten years of development, America finally has Brazilian director José Padilha’s RoboCop, a buffed and bloodless affair that features a staggering A-list cast. With names like Gary Oldman, Michael Keaton, Samuel L. Jackson, and Jackie Earle Haley filling up the cast list, you’d think that there must be something solid to this blatantly unnecessary remake of a classic. 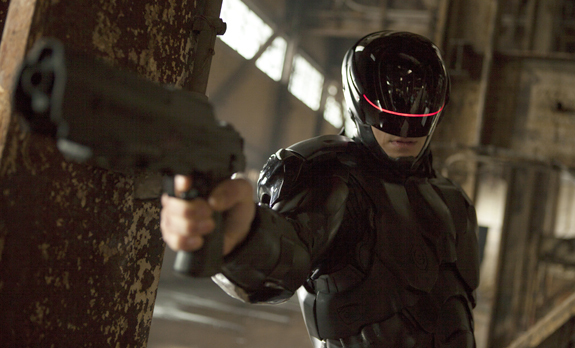 Truthfully, RoboCop 2014 isn’t nearly as bad as you may have expected it to be. It’s far from empty headed and the veteran performances carry plenty of weight, but the film is so concerned with making an intelligent statement that the film nearly forgets to have any fun or offer any adrenaline-pumping set pieces. It also makes the grave mistake of handing over the title role to Joel Kinnaman, a newcomer that works hard but never fully earns our sympathy or respect. RoboCop picks up in Detroit, 2029, with police officer Alex Murphy (played by Joel Kinnaman) and his partner, Jack Lewis (played by Michael K. Williams), doing some dangerous undercover work in an attempt to bring down crime boss Antoine Vallon (played by Patrick Garrow). In their investigation, they begin to discover that Vallon may have ties to several officers in the Detroit police department. After a nasty confrontation between the undercover officers and Vallon’s men, Jack is left severely wounded and clinging to life. Alex manages to make it through the confrontation unscathed, but Vallon’s men soon track him down and implant an explosive device inside his car. While enjoying a quiet evening at home with his wife, Clara (played by Abbie Cornish), and his young son, David, the device is triggered, leaving Alex with fourth degree burns covering his body. Meanwhile, in Tehran, the United States is waging war with the help of robotic soldiers and hulking droids created by OmniCorp. On American soil, OmniCorp CEO Raymond Sellers (played by Michael Keaton) is pushing to have these robots and droids patrol American streets, but he is met with resistance from Senator Hubert Dreyfuss (played by Zach Grenier), who claims that the robots and droids lack human emotion. Desperate to make his vision a reality, Sellers enlists the help of Dr. Dennett Norton (played by Gary Oldman) to meld man with machine. 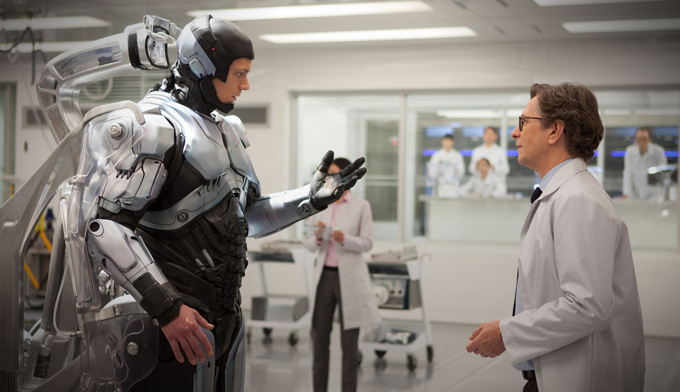 After a lengthy search for a proper candidate, Sellers and Norton settle on Alex for the human/robot program, and in the process create a revolutionary new figure of justice—RoboCop. Where most blockbusters today attempt to mask their lack of intelligence with countless CGI battles, gunfights, fistfights, and miles of devastation, RoboCop begins with heady debates about the use of robots and droids in the thick of war. The battle rages on a nightly news program called The Novak Element, hosted by Pat Novak (played by Samuel L. Jackson). In this sequence, we are treated to some tense urban action sprinkled in between Novak’s bug-eyed stare and his questioning of America’s “robophobia.” Points are made on both sides of the issue, bullets fly, bombs explode, and things seem to be getting off to a strong start even before the credits have rolled. Padilha and his crew are letting us know that they are well aware that the original RoboCop was interested in smarts just as much as it was interested in spilling blood, and you have to commend them for acknowledging this. However, as the seconds tick by in RoboCop 2014, it becomes increasingly clear that the filmmakers seem reluctant to have a little fun. There is a brief rush of giddy excitement when Alex steps into a training session in an abandoned warehouse, but the action feels square and the approach is uninspired as Jackie Earle Hayle’s Rick Maddox taunts the stomping RoboAlex by calling him “Tin Man.” I’m sad to report that the action rarely picks up from here, only really cutting loose during the final showdown in the OmniCorp lobby. While the action may not exactly take your breath away, a good majority of the performances will keep your eyes glued to the screen. Perhaps the most mediocre of the bunch is Kinnaman, who fails do anything interesting with his screen time. He’s the typical macho cop/mushy family man in the early scenes, and when he’s sentenced to his new RoboArmor, he’s only sporadically pathetic as he realizes that he will never have a normal life again. Still, he can droop his mouth into a proper frown as he aims his machine gun and fires at the bad guys, which is always an action-movie plus. The ever-welcome Oldman is the top dog here as Dennett, the doctor tasked with placing the injured cop inside a machine. Oldman earns more sympathy when he is forced to switch off Alex’s emotions than the actual RoboHero does. Keaton nails his role as Sellers, the ruthless OmniCorp CEO who may not be as upstanding as he seems. Jackie Earle Hayley does a fine job as Maddox considering that the screenwriters have handed him the film’s worst dialogue. Strapped inside his exoskeleton, he looks like something out of Elysium, but he still finds a groove as a certified badass. Jackson is his usual shouting self as Pat Novak, the nightly news host who speaks directly to the audience and acts as a pale moderator to all the heated debates. Abbie Cornish rounds out the main cast as Alex’s suffering wife, Clara, who slowly regrets allowing the suits of OmniCorp to slap her husband inside that black armor. Undoubtedly the most controversial change in RoboCop 2014 is the PG-13 violence that the studio opted for rather than the gruesome R-rated approach Verhoeven took to the original. Throughout it’s nearly two-hour run time, there is barely a speck of blood, which makes it clear that Columbia intends to turn this new RoboCop into a sanitized series that will sell just as many toys as it does tickets. Despite the lack of bloodshed and carnage, Padilha’s RoboCop is still a well-paced story that builds quite nicely. The only time that the film really drops the ball is with Vallon and his villainous shenanigans. He is quickly bumped off and forgotten so that Padilha can make room for bigger and badder tricks. It also wouldn’t have hurt to include villains that are a bit more colorful than what we are left with. Overall, you can’t fault RoboCop 2014 for attempting to be much more than a mind numbing, popcorn-muncher of a film, but this constant strain to be saying something prevents the audience from receiving the action jolt they are craving. Maybe a different lead would have helped, too. Oh well, as far as remakes go, it could have been much, much worse. Posted on March 2, 2014, in REViEW and tagged 1987, 2014, abbie cornish, action, gary oldman, jackie earle hayley, joel kinnaman, josé padilha, michael k. williams, michael keaton, patrick garrow, paul verhoeven, samuel l. jackson, science fiction, thriller. Bookmark the permalink. Leave a comment.